● 7x კამერიანი, ჩასაშენებელი ტიპის, ვიდეო სტუდია. 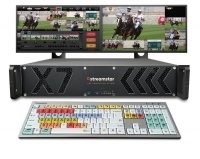 ● სიგნალი Inputs /HD-SDI / IP stream / NDI ● Output HDMI/HD-SDI - PGM. ● შიდა Live მედია ფლეილისტი / Overlay /CG /Ingest.● ჩაწერა ISO / PGM / Stream / Replays. ● 4x კამერიანი, ჩასაშენებელი ტიპის, ვიდეო სტუდია. ● გამეორება 4 არხის/შიდა გრაფიკა/ლოგო/ხმის მიქშერი/JVC smart PTZ მართვა. ● შიდა Live მედია ფლეილისტი / Overlay /CG /Ingest. ● ჩაწერა ISO / PGM / Stream / Replays. ● 2x კამერიანი, ჩასაშენებელი ტიპის, ვიდეო სტუდია. ● სიგნალები HD-SDI / IP stream / NDI. ჩაწერა ISO / PGM / Stream / Replays. ● გამეორება 2 არხის/შიდა გრაფიკა/ლოგო/ხმის მიქშერი/JVC smart PTZ მართვა. 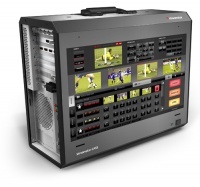 Streamstar CASE 500 is a full-featured, 4 camera streaming production studio in one compact and portable package. 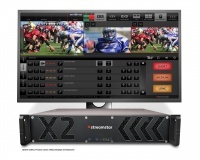 Its range of features like Replays and Slow Motion on all cameras, Monetizing System, comprehensive Media Playlists, top quality video processing and the unmatched reliability track record make it the best choice in portable production system available. Superb graphics capabilities and the intuitive, touch screen user interface allow for incredible flexibility, greatest creative freedom and remarkable ease of use. 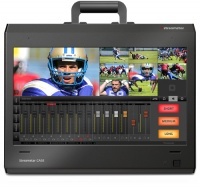 With Streamstar CASE 500 portable live production studio you’ll achieve better results smarter, faster and easier.